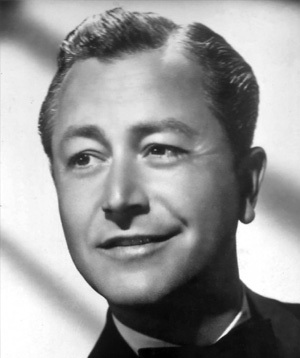 Born in 1907 in Chicago, Robert Young moved with his family to the West Coast during his childhood. The family settled in Los Angeles, and after high school, Young enrolled as an acting student at the nearby Pasadena Playhouse. He was discovered by an MGM talent scout while touring with a stock theater company, and later began to land bit parts in silent films. Young made his first sound film in 1931, a Charlie Chan detective movie called Black Camel. Somehow, Young was trapped in the mire of MGM’s “B” movies. These secondary films were churned out quickly and intended only to fill out double bills in support of majorreleases. Nevertheless, he managed to star opposite famed leading ladies such as Norma Shearer, Joan Crawford, Helen Hayes and Hedy Lamarr. Young’s career with MGM ranged from light comedies to dramas, but there was never much of an acting stretch. Young remained irritated with MGM’s narrow casting for decades after leaving. Following the end of his contract there, he branched out to work for a variety of Hollywood studios. Once free from MGM’s casting restrictions, he played against type and received plaudits from reviewers for these more difficult roles. Even so, his film career declined in the 1940s. In 1949, a turning point for Young was Father Knows Best, originally a radio program that ran until 1954. In that year, the program made the jump to television. It was a huge success and made television history. Young personified the perfectly wise, understanding and steady dad for the idyllic American family. The show had a long run, airing through 1960. It became a cultural touchstone for more than one generation, and Young became a fixture of Americana for his role in the series. In 1969, Young staged a TV comeback in Marcus Welby, MD, playing a general practitioner with a personal concern for his patients. As a mentor to a young doctor, Young was again television’s font of wisdom. Like Young’s earlier series, Welby had a long run, airing through 1976. After bowing out as a weekly series, the show was reprised in several made-for-TV movies starring Young, the last one coming in 1988. Along the way, Young won Emmy Awards for Father Knows Best and Marcus Welby, M.D. He also won a Golden Globe for the latter role. Young’s marriage was long-running too. He was married to Betty Henderson from 1933 till her death in 1994. The couple had four daughters. Battles with depression belied Young’s happy and steady TV persona. At a low point, he once attempted suicide. Later, however, Young turned his dark struggles into an effort to enlighten others. He spoke candidly about his depression, encouraging people to overcome the stigma of mental illness and to seek help without embarrassment. He was instrumental in persuading the public to fund mental health care in Illinois, his home state. For that accomplishment, he was the namesake of the Robert Young Center for Community Health in Rock Island, Illinois. Young passed away in 1998 at the age of 91. No one within sight of a TV screen in the 50s, 60s or 70s could forget him.